Business Process Orientation: Gaining the E-Business Competitive Advantage provides the "why" and the "how" for building the "horizontal" organization - an essential component of the "e" in e-commerce and business. This book shows you how to weave your business processes into hard-to-imitate strategic capabilities that distinguish you from your competition. The book explores the impact that well-defined and carefully integrated processes have on organizational performance. Using the results of extensive research conducted among consumer, business-to-business, and services-based companies, the authors demonstrate that adopting a business process orientation (BPO) has a positive impact on the organizational culture and business performance. The resulting process oriented e-corporation is now positioned as a necessity not only to thrive but also to survive. The old ways of conducting business are out: pushing costs and compromising quality in order to achieve the lowest possible price. The emerging paradigm focuses on the core processes. The hallmarks of a great business still include high customer relevance, internally consistent decisions about scope and value chain activities performed, value capture mechanisms, a source of differentiation and strategic control, a sound operational system, and carefully designed processes. Business Process Orientation: Gaining the E-Business Competitive Advantage shows you how to balance your functional and horizontal orientation to create and maintain a healthy organization. "Competition in today's world of the e-corporation is between supply chains, not between individual companies. 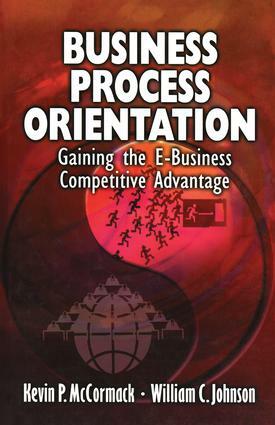 Cross company process integration and process orientation will be the critical competitive advantage of the winners." -Bill Hakanson, Executive Director, Supply Chain Council, Inc.
"A major driver in the successful e-transformation of legacy companies is the degree to which business work processes are understood and optimized. A process orientation is the key." -Edward Huller, Vice President, Global Supply Chain, Borden Chemical, Inc.